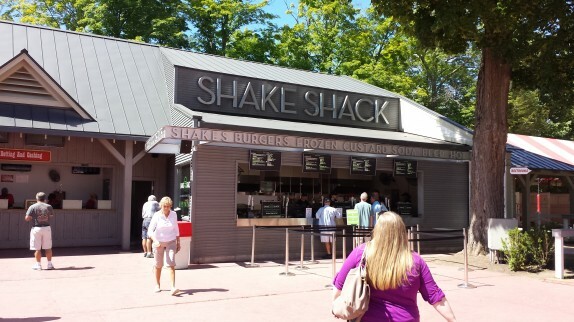 Saratoga race season ended earlier this month, and just before the end, I stopped by to have some fun at the races and to try out the food at Shake Shack. 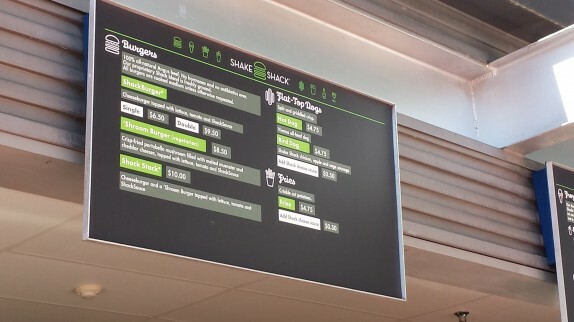 Between the media and personal connections, I’d heard a lot of great things about Shake Shack, so it’s been a priority of mine to try a burger, fries, and shake. The Madison Square Park NYC version, where the line is usually so long there’s a webcam you can monitor online, is not really my style since I don’t do well in lines, so having an installment of this eatery a hop, skip, and jump away is a bit more appealing. 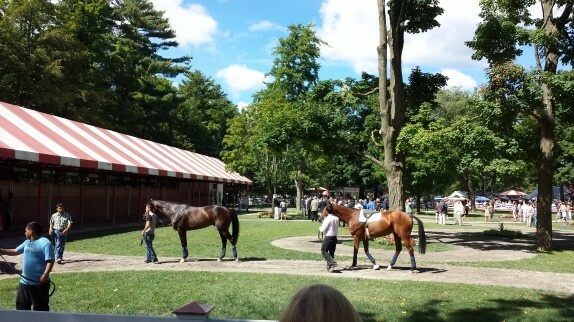 I hadn’t been to the Saratoga Race Track in about 7 years, and my memory was that the food there was fairly unimpressive. The most memorable thing from the past was a $8.75 “Ultimate Chicken Sandwich” that was a stale bun with a dry, over-steamed piece of chicken breast and a stingy amount of fry sauce. In my recent trip, I was floored by the food options. There were food trucks, more interesting stands (like Hatties and Lobster Rolls), and even the snack booths looked better. 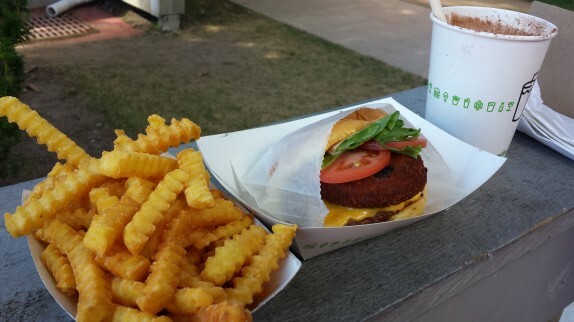 Shake Shack is a little off the beaten path near the paddock area. I guess for some people, that’s right on the beaten path, but, when I go to the track, I like to hang out at the center of the track near the mediocre chowder stand. Leave me alone; that’s my good luck spot. 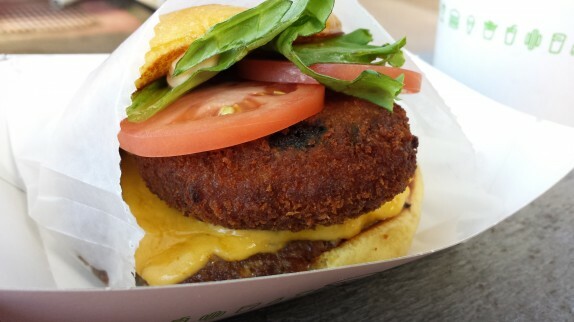 At Shake Shack, I ordered the “Shack Stack” which is a double decker of their cheeseburger and ‘shroom burger and clocks in at a whopping $10. 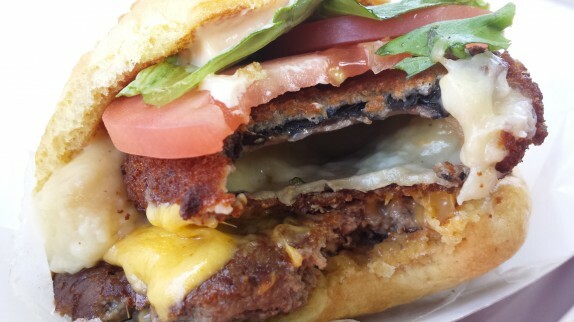 It’s basically a 1/4 burger patty topped with cheddar cheese and a breaded and fried portabello mushroom. I’m going to come right out and say it: $10 is an absolute rip off for this. And I’m saying this not only from the point of value, but the fact that it’s on a very recognizable Martin’s Potato Roll makes it seem very easy to recreate at home. The more memorable bites of the burger were from the sharp, steamed cheddar cheese, and the fried portabello, which had a very crisp breading shell encasing a perfectly cooked mushroom. The crinkle cut fries were much better than the burger. They were crispy, well seasoned, and memorable in that crinkle cut fries are uncommon. For $4.75, the portion was hefty, but, if you’re keeping track, we’re up to $15, and I haven’t even reached the drink. 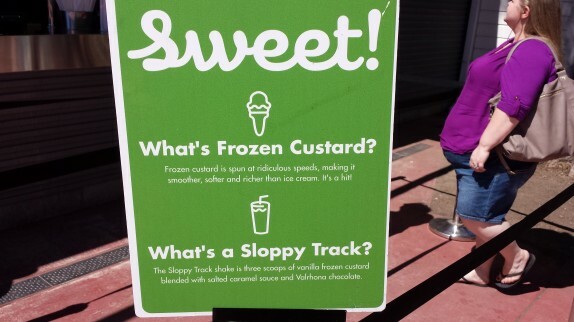 The shakes at Shake Shack are mixed with what they call Frozen Custard which they claim has a thicker and richer texture to ice cream due to being spun at a higher frequency. There’s also a claim that the milk that goes into their ice cream and shakes comes is free of artificial growth hormones. For the Saratoga Track, a special “Sloppy Tracks” shake is offered and is described as “three scoops of vanilla custard blended with salted caramel sauce and Valrhona Chocolate.” I was most excited about the shake, partially from the description, but also from some word of mouth and the sight of 8-10 spindle drink mixers behind the counter. As great as this $6 shake tasted, the sight of the clerk turning around, bending down, and pulling my previously mixed and dressed shake from a cooler was disheartening. I could understand having some pre-made for the sake of throughput on a very busy day, but we were the only clients on the line, and it didn’t look like it was terribly busy. Regardless, forgetting about this, the shake was probably the best part of the meal. 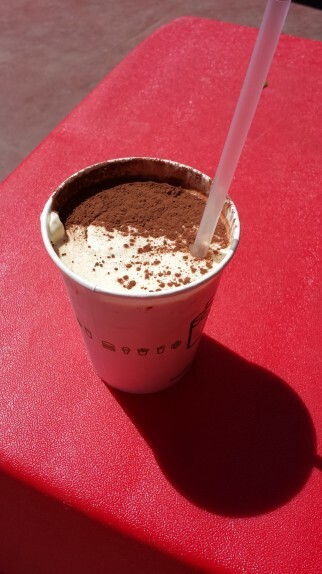 I’d equate the consistency of the shake to softened soft serve ice cream. It’s barely drinkable with the straw, and the heat transferred in holding the cup softens it just enough to pass through the straw. The salted caramel added some even more sweet swirls through drinking, and the dusted chocolate did the same. Some sips tasted extra sweet and chocolaty. If the caramel and chocolate were mixed into the shake, their flavors would totally be lost in the intense vanilla custard. As negative as my observations seem, I enjoyed the meal. I was used to overspending on bad food at the track, so overspending on average to very good food is actually a step in the right direction. I totally understand that the track attracts tourism which would be reflected in the price, but with other great options so close, including an amazing burger (twice the size) and fry dinner in a nice restaurant just miles away, unless you’re at the track, I can’t say it’s worth a special trip. I love the Shackburger. That said, the burgers at Comfort Kitchen are also awesome, and they’re available all year and don’t require me to pay to get into the track, too. I had a pretty good burger there — just the single ShackBurger so I would have more money in my pocket to lose at the window. Not to stray off topic, but what did disappoint me was Shirley’s Montreal Poutine. It was oddly bland for a dish that should be so packed with flavor.